Extensive research into the improved corrosion protection offered by Galfan coating in Rural, Industrial and Marine environments has been undertaken both by the International Lead Zinc Research Organization, and by Bekaert Corporation, the findings listed above show that the Galfan offers much better corrosion resistance than does standard galvanized zinc. To appreciate the improved corrosion resistance, the corrosion mechanism should be understood. Galfan solidifies into lamellar microstructure consisting of alternating very thin plates. In this type of structure the more active zinc will corrode first leaving an aluminum enrichment which continues with exposure to elements. Therefore the longer the exposure the more corrosion resistance the coating becomes. The result is that the loss of coating weight is not linear as with galvanized zinc but parabolic. Galfan offers a more homogenous, ductile and smoother coating than does galvanized zinc. The result is that the galfan is less affected by abrasion. Galfan coating offers up to 3 times better corrosion protection than standard zinc coating in salt spray test, and up to 2 times better corrosion protection than standard zinc coating in the SO2 Atmosphere test. Galfan offers better sacrificial protection of the steel wire than standard galvanized zinc. Galfan gabions use the same wire diameters as the galvanized gabions. This is an advantage in corrosive environments over PVC coated gabions that have a reduced steel wire diameter as compared to the galvanized gabions. The result is a better corrosion protection coating than the galvanized zinc or the PVC coated gabions. Because the corrosive resistance of the gabion wire is directly related to the longevity of the gabion wire and therefore the confinement ability of the gabion basket it is recommended that Galfan Coating be utilized when corrosion is the predominant factor for determining the expected life span of a gabion structure. mesh opening 31/4 by 41/2 inches or 8cm x 10cm. All of the above wire diameters are subject to a tolerance limit of 0.004 in accordance with ASTM A-641. DURA-FLEX™ GABIONS are defined as double-twisted woven wire mesh box shaped baskets, of various sizes and dimensions. The selvedge of the gabion baskets are the thicker perimeter and edge wires to which the mesh is secured as to withstand sudden or gradual stress from any direction, which is unique to the double twisted mesh gabions only. Reinforcing wires are the thicker wires incorporated into the netting during fabrication. 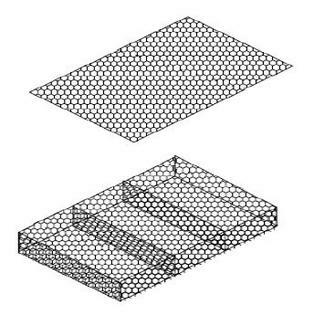 The internal diaphragms are the internal wire mesh partitions which divide the gabions into cells. Lacing or tie wire is used to assemble and join the gabion units. Connecting wires are the internal wires used to prevent the gabions from bulging. Alternative wire fasteners such as hi-tensile steel hog rings and TIGER-TIES™ are ASTM approved wire fasteners used in lieu of lacing wire. DURA-FLEX™ Gabions are fabricated in such a manner that the sides, ends, lid and diaphragms can be assembled at the construction site into rectangular baskets of the sizes specified. Gabions are of single unit construction: the base, lid, ends, and sides are all connected into a single unit. 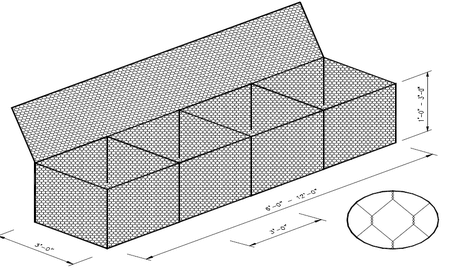 Where the length of the gabion exceeds 1-1/2 its horizontal width, the gabion is divided by diaphragms of the same mesh and gauge as the body of the gabion, into cells whose length does not exceed the horizontal width. The gabion is furnished with the necessary diaphragms secured in proper position on the base in such a manner that no additional tying is required at this juncture. The double twisted hexagonal wire mesh has deformability sufficient to permit minimum of mesh elongation equivalent to 10% of the un-stretched length of the mesh test section without reducing the gauge or the tensile strength of the individual wire strands to values less than those for similar wire, one gauge smaller in diameter. The double twisted hexagonal wire mesh is fabricated in such a manner as to be non raveling. This is defined as the ability to resist pulling apart at any of the twists or connections forming the mesh when a single wire strand in a section of mesh is cut or broken. The stone fill material used for filling the gabion units shall be clean, hard stone with pieces ranging from 4 to 8 inches. Stone filling shall not exceed 24 inch vertical drop above the gabion basket. Tolerances: All gabion dimensions shall be within a tolerance limit of plus or minus 5% of the manufacturers stated dimensions. Tests have been carried out to compare side-by-side the performance of Galfan to Galvanized coating for steel wire. Each gabion unit is assembled by tying or fastening all connecting seams. The binding wire shall be tightly looped around every other mesh opening along the seams in such a manner that single and double loops are alternated. An alternative wire fastener may be used in lieu of lacing wire. The alternative wire fasteners shall be applied at approximately 4 to 6 inch intervals on all vertical and horizontal seams. Not less than 3 fasteners per one foot on any given seam. A line of empty gabions, shall be placed into position according to the contract drawings. Binding wire or alternative wire fasteners shall be used to secure each unit to the adjoining one along the vertical reinforced edges and the top selvedges. An approved corner closure tool shall be used to adjoin adjacent gabions to insure a tight, neat seam and minimize gabion wired or fastened to the latter at front and back. The lid shall be secured with an approved closure tool to insure proper closure without excessive mesh deformation. To achieve optimum alignment and finish for retaining walls, a minimum amount of stretching may be required. Connecting wire shall be inserted during the filling operation as follows: The connecting wires shall be installed according to manufacturer’s instructions every 1 vertical lift of the gabion unit.